Erin teaches meditation and Executively Directs the Consciousness Explorers Club. Her focus is on meditation for self-care and emotional well being and she has taught mindfulness skills in health care, education, corporate and non-profit settings. She also does mindfulness coaching for individuals, with a specialty in encouraging emotional self-regulation. Her practice and teaching have been aided immeasurably by CEC founders and co-conspirators Jeff Warren and James Maskalyk, and influenced by Shinzen Young, with whom she’s been retreating bi-annually since 2014. She has a background in social service work, having served as Youth Program Coordinator for ehm from 2007-2018, where she ran a youth centre and support programs for low-income children and youth in downtown Toronto. She also studied and worked in theatre for many years, and loves to infuse her teaching with a sense of play and creative exploration. 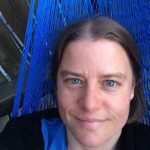 Erin is passionate about the confluence of meditation practice and social justice, and using mindfulness in the service of caring better for oneself and others.